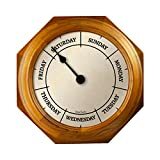 Maybe you're retired and losing track of the days in your unscheduled freedom, can't find your smartphone to check the date, or just enjoy extra analog data, then check out this cool new Day Of The Week Clock. 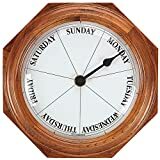 This unique oak wall clock not only keeps track of the time, it also keeps track of the day of the week as well. It has the traditional hour and minute hands and also a red hand that continuously moves through seven pie-shaped sections that represent each day of the week. A cool wall clock for anyone who can still read analog clocks. Wall clock that at a glance answers the query "what day is it?"